Rendering of the deer on campus. As students were studying hard and fending off the cold Nov. 17, those who receive WJC Alerts (William Jewell College’s alert system) got an unexpected message. Unprecedented as it was, this alert had the campus buzzing. 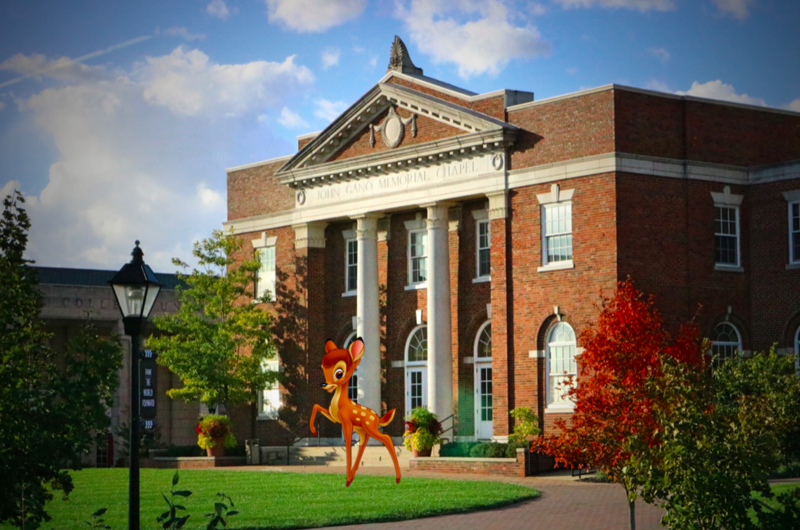 Despite many students already having left for Thanksgiving break, those remaining students feared this deer. According to Landon Jones, director of campus safety, there were about three reports of this aggressive deer. When asked about the incident, he explained that the College is near large wooded areas and this is not the first deer sighting on campus. Spotting deer is relatively normal in this area. Such clarification indicates that the campus is relatively safe from such deer and that this should not become a focus of student anxiety. One of the students who reported the aggressive deer was Annie D’Annibale, senior nursing major. D’Annibale was running by the baseball field on her way back to Senior House when the confrontation occurred. On her run, D’Annibale noticed something out of the corner of her eye – the deer, running at her. D’Annibale stopped moving to avoid the threat. “He [the aggressive deer] stopped about 4 feet from me and started snorting. We had a standoff for about 5 minutes of me trying to move without him starting to run at me again,” D’Annibale recounted. The encounter ended peacefully. D’Annibale called her roommate to call Campus Safety to report the standoff. In case of such an encounter, it is important to have Campus Safety’s number saved in your phone. The number is also on the sticker placed on the back of your student ID. Contact Campus Safety by calling (816) 365-0709. “I was super scared. It’s funny now though,” D’Annibale said about a week after the incident. In a positive twist of fate, the saga ended without excessive drama. “The deer eventually went back to the woods around the golf course area. We did consult with the conservation department to make them aware. But fortunately the deer moved on by itself,” said Jones. Local Liberty resident, and certifiably not an expert on deer, Luke Dema advised that “once you see it, it’s already too late.” He is incorrect. Featured image courtesy of Catherine Dema.